The email status message of Dayamani Barla, the tribal activist from Jharkhand always reads, “Ladenge.. Jeetenge…” (We will fight… we will win). Fighting against the establishment’s unjust policies and protecting her fellow tribals from displacement has become second nature for Dayamani. Along with the struggles however, there have also been awards and accolades. The awards she has won include the Counter Media Award for Rural Journalism, the National Foundation for India Fellowship, and the Chingari Award. The latest is the 2013 Ellen L Lutz Indigenous Rights Award from Cultural Survival, an international non-governmental organization (NGO) in recognition of her pioneering grass root leadership for tribal rights. Cultural Survival works with indigenous peoples across the world to defend their lands, language and culture. Barla was chosen from amongst 60 nominees from across the world. Described as the “Iron Lady of Jharkhand” for her fearless opposition against the infringement of adivasi rights, she was presented the award, which includes a US $10,000 cash prize, at a ceremony at the National Museum of the American Indian in New York on 23 May. The event also coincides with the twelfth session of the UN Permanent Forum on Indigenous Issues (UNPFII). The award has been instituted in the memory of late Ellen L Lutz (1955-2010), a well-known human rights lawyer and former executive director of Cultural Survival. 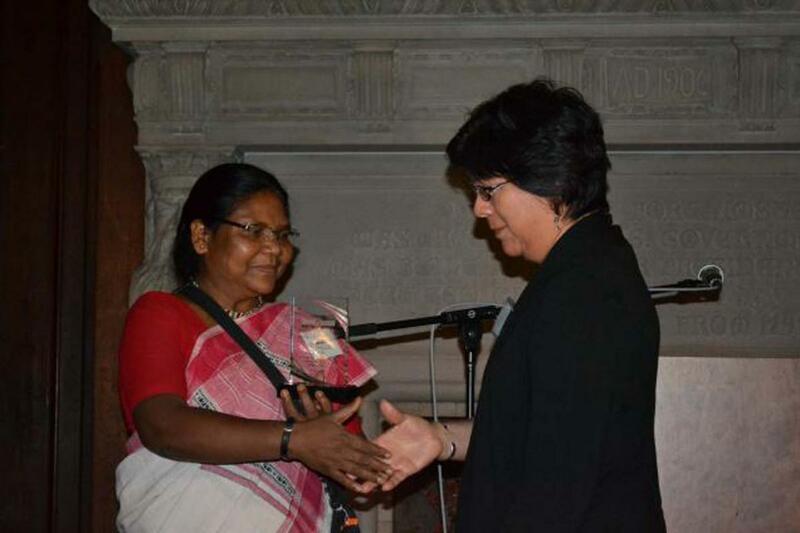 “Cultural Survival is honored to present Dayamani Barla, an Indigenous human rights activist and journalist from the Munda tribe in the Indian state of Jharkhand, with the award,” said its Executive Director Suzanne Benally. Barla has been at the forefront of people’s movements against corporate and government-led land grabs and other injustices that threaten the survival, dignity, and livelihoods of Indigenous Peoples. “This award is presented in recognition of outstanding human rights work, dedicated leadership for Indigenous Peoples rights, and a deep life commitment to protecting, sustaining, and revitalising indigenous cultures, lands, and languages,” Benally added. Her crusade to protect the rights of fellow tribals began from the days of agitation against the Koel Karo hydel power project in the 1990s, near Ranchi, in then undivided Bihar. The proposed dam threatened to submerge nearly 55,000 acres of agricultural land displacing about 2,50,000 indigenous people. Further, 27,000 acres of forests would have met a watery grave alongwith the sarna sasan diri (religious sites) of the tribal communities. The agitation gave birth to a new slogan “We will not part with an inch of our land….” which continues to reverberate in the tribal areas of Jharkhand even today. The proposal of the dam had to be finally shelved by the state government, after nearly eight tribals lost their lives in police firing on 2 February, 2001. Koel and Karo are not just rivers for us – they represent our cultural identity forming the basis of our livelihoods. When eight adivasis were martyred on 2 February, we realised that the state whose foundation stone was laid on 15 November 2000 is not actually for us tribals, but simply for the exploitation and plunder of the natural resources of our native state and jeopardisation of our existence…. She took the challenge headlong on behalf of her tribal community, leading several agitations in the state against land grabs. She dared to rise against the world steel giant Arcelor Mittal who had proposed a 12 MT steel plant by taking away about 12,000 acres of land spread across nearly 40 villages in Khunti and Gumla districts of the state. In 2006 she began mobilising the public against such attempts at forcible land acquisition under the banner of the Adivasi Moolvasi Astitva Raksha Manch (Forum for the Protection of Indigenous People). “ Loha nahi anaj chahiye!” (“We want grains, not iron!”) was the rallying cry of indigenous communities protesting against this project. “The government says that those getting displaced will be compensated and rehabilitated. But the question is – what will the government and the companies compensate for?” asks Barla. “Can they rehabilitate our pure air, forests, rivers, waterfalls, our language culture, Sarna-Sasan Diri, our identity and our history? No, that is absolutely impossible…for us adivasis land is just not land but the heritage of our ancestors who cleared the forests and made the land worth living and cultivating,” she adds. Finally, the steel baron had to give up his dreams of setting up a steel plant in the tribal state. Barla however clarifies that the tribals are not against development but it should be sustainable and not at the cost of uprooting them. “We should also be a part of this development process by getting access to health, education, jobs etc. We want development of our identity and our history— social values, language and culture. We want the polluted rivers to be pollution free. We want wastelands to be turned green…. This is our model of development”, she says. 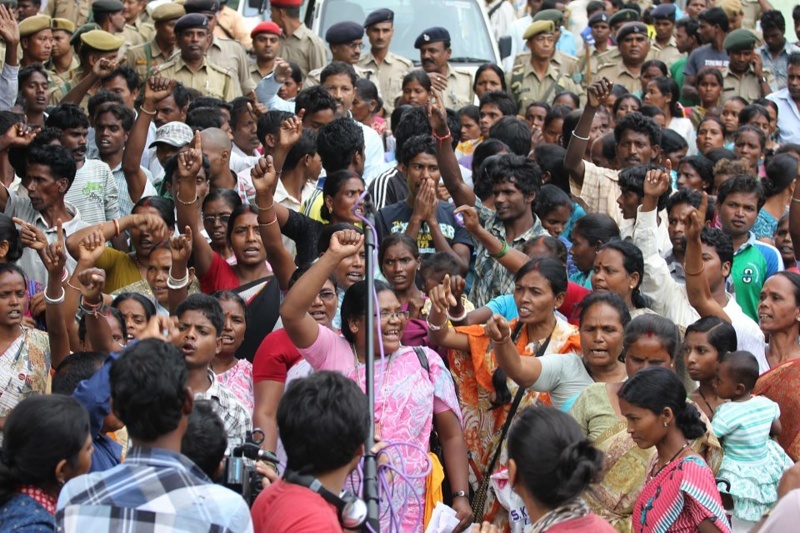 Recently, the state government was locked in a major anti-displacement struggle against adivasi farmers at Nagri. Barla who was at the forefront of the agitation was jailed from 16 October to 24 December, for taking part in demonstrations with the farmers of Jharkhand. The battle was over 227 acres of fertile land that has sustained the tribals in the region for generations. However, the government had allotted it to the Indian Institute of Management, the Indian Institute of Information Technology and the National University of Study and Research in Law (NUSRL). Caught in this crossfire were about 128 affected families, who claim to be the lawful owners of the land. They contend that neither they nor their forefathers had agreed to sell their lands and had not accepted the amounts for the deal at that time. Coming from a family of bonded labourers who had lost their lands in the name of national development, Barla could well identify with their sufferings. Barla argued that the instituions be allotted alternative area for their campuses instead of their fertile paddy land. “If we demand a National Rural Employment Guarantee Act (NREGA) card, they issue a property warrant. If we demand our land, water, forests, the Jharkhand government says we are a danger to the state. They book us in false cases, by calling us Maoists…. Is this the freedom that leaders like Birsa Munda fought for?” she asks. Considered as the “Voice of Jharkhand” for her struggles and powerful pen, she is also the first journalist from the Munda tribe. “Barla has charted new waters as an Indigenous woman to ensure the voices and perspectives of Adivasi people are heard by the larger mainstream society,” says her nominator Terry Odendahl, executive director and CEO of Global Greengrants Fund. She funded her education by working as a domestic help. Even today, her source of livelihood is a road side tea and snacks stall “Jharkhand Hotel”, run by her husband Nelson. For Barla, activism and journalism go hand in hand. “When I visit different villages as a journalist I listen to their issues first. Then they ask for possible solutions to their concerns and in the process, I find myself getting involved in their struggles”, she confesses. But to be involved with the struggles and stand with the people does not mean that she has to quit writing. “I am an activist as well as a journalist.” However, it has not been easy for her to make forays into mainstream journalism “It has always looked down upon us adivasis as uncivilised, naïve and foolish. It is a stereotype to say that adivasi are stupid. Now we are trying to prove that we are not… ” she says, smiling.